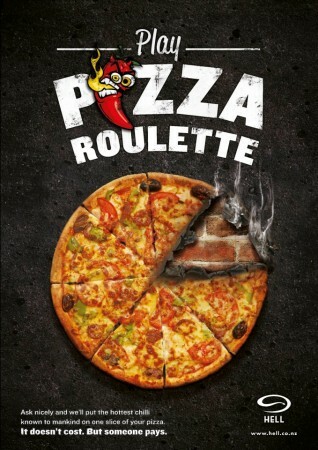 Pizza & Chocolate Russian Roulette Games - Bite The Bullet! This is a very tasty game of Russian Roulette called. 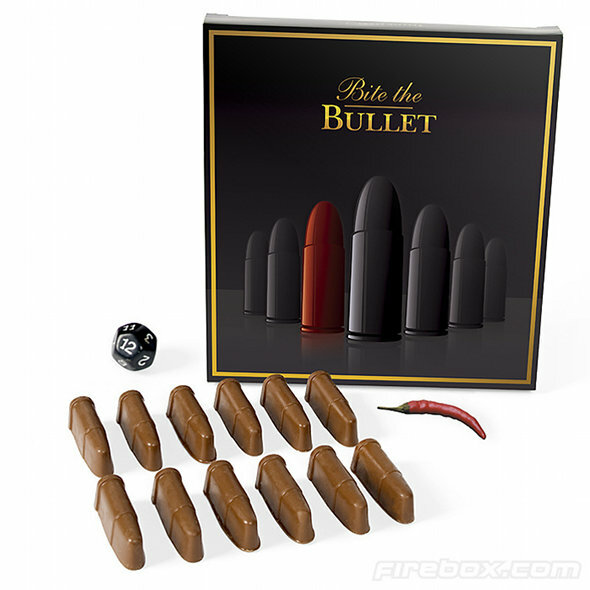 The packaging contains 12 bullet-shaped chocolates but one has an insanely hot pepper inside. Line up the bullets and roll the 12 sided die (included), and eat a bullet indicated by the die. Get non-hot pepper. Fake agony. Watch the other unsuspecting people wolf the rest down. Observe fireworks. I never knew the Kiwis had such adventurous colons. In this game (more an ingenious marketing scheme), you order your pizza from the nice folks at Hell Pizza and politely ask that they add a few drops of the “hottest chilli known to mankind” in a random slice. The best part is – you get this awesome deal for NO EXTRA MONEY! Scratch that – the best part is not being the one to draw the lucky slice.